A few months ago, I was beginning to feel as if life were terrible. I was getting discouraged about several matters, and most of all, I was exhausted. The reason was that I had not taken much time off to recharge and rejuvenate. The blessing was that my husband’s grandmother had a milestone birthday, and we had been planning for four-and-a-half months to go visit her. Since the trip would be overseas, we decided that we would make a vacation out of it. Although I am one that usually prefers to stay home and go nowhere (unless I have to buy groceries), just the fact of looking forward to something out of the ordinary and a break from the day-to-day tasks was refreshing. You can spend more quality time with loved ones. Life is busy, and sometimes relationships do not get as much attention as we intend to give them. During a vacation, you have much more time together uninterrupted. During our vacation, it was a huge blessing to wake up and spend as much time as we needed to get ready, read our Bibles, prepare breakfast, and eat. You can get a healthy change of scenery for a while. Sometimes life can feel as though it’s in a big rut. 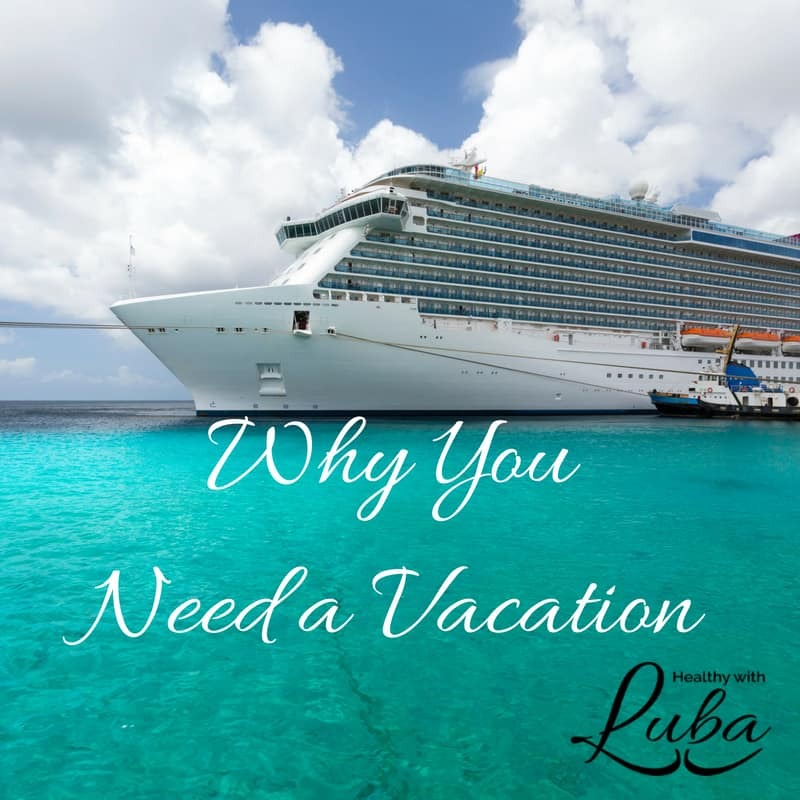 Yes, you love your family and find satisfaction in helping friends and clients, yet it’s important to get away to see different places for a short time. My husband and I were able to visit a museum in which I learned something about my family, a sea where it was peaceful and calm, and many little shops along our vacation. We were also able to ride a train and electric car, as well as to see history that dated back to the thirteenth century. You will have a healthy change of perspective. Even as I was working ahead on my business in preparation for vacation, I learned how to be more efficient and productive in my business. Just the thought of going on vacation motivated me and helped me prepare to be gone for two weeks. As we traveled mainly using public transportation, I learned to appreciate having a car and being able to go where I needed without relying on public transportation. You will learn to appreciate other cultures. Sometimes the only way you know how to do something is how you have always done it. It’s healthy to see how others live day-to-day and appreciate their life as well as your life. For example, where we visited, most people, regardless of their monetary wealth, do not have dryers. They have washing machines and hang up clothes to dry, even in an apartment. In addition, they are very careful not to waste water and electricity. History was one of my favorite subjects in school, and there is nothing like seeing history in person. We saw history pertaining to World Wars I and II as well as history from the Soviet era. It was sobering to be in a place where such evil was present. If you visit countries where you have never been before, you can learn so much that you may never read in a history book. First-hand experience is always the most valuable. You can get extra rest. With time off from work and business, we were able to take plenty of time to rest and be rejuvenated. When we wanted to take an entire day and read, we could do that. Because neither of us had to be up early, early in the morning, we were able to catch up on sleep and feel more alive. No obligations were demanding our attention, and rest was a priority for us on this trip. Go here to read about the seriousness of a lack of sleep in your life. You can make life-time memories with your family. Our vacation was somewhat emotional. With my husband’s grandmother aging, it is not certain if this was the last time we would be able to see her here on earth. It was a blessing to take several pictures with her. In addition to the memories we made with Grandma, my husband and I were able to see places that we may never be able to see again in our lifetime. The pictures and videos we took are valuable, and the memories we made together are priceless. Oh, and I returned from vacation feeling very blessed and thankful for time with family and extra time with my husband. God taught me how much He cares for me and loves me! My friend Ayelet is a friendly, caring person who will take the best care of you in arranging your vacation plans so that you can relax and have a stress-free vacation. Visit her website here or call her now at 952-681-2232 to learn how she can help you! Please share this post with your family and friends using the buttons to the left.